CHRISTCHURCH — The Muslim call to prayer rang out across New Zealand on Friday followed by two minutes of silence nationwide to mark a week since a white supremacist gunned down 50 people at two mosques in the city of Christchurch. 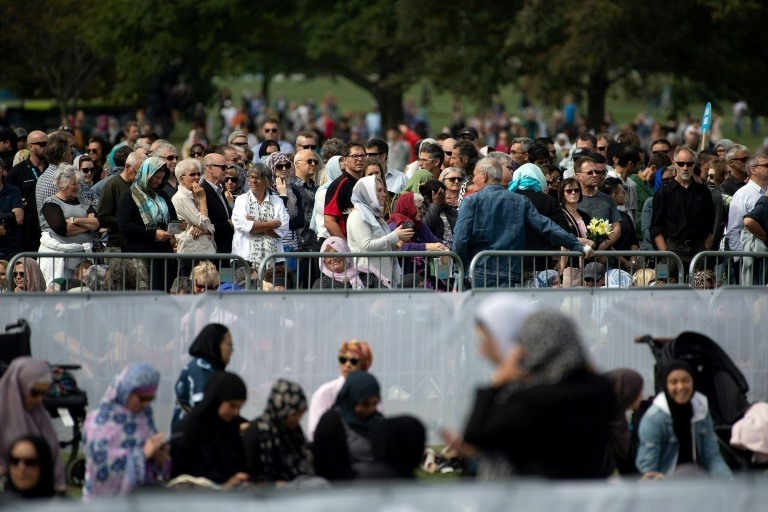 A muezzin in white skullcap issued the call to regular Friday prayer at 1.30 pm (0030 GMT) with chants of "Allahu Akhbar" (God is greatest) as thousands listened in Christchurch’s Hagley Park across from the Al Noor Mosque. "I personally am doing this to knock down my walls of personal oblivion to the terror Muslim people feel every day, worrying about their safety,"
Wilkinson said before the prayers began. "I can take my scarf off if I feel afraid. They cannot." "The message I want to send is that hate cannot win. We are all just people. What happened is not ok."
"Obviously this is all spurred on by the terrible tragedy in Christchurch but it’s also a way of showing that any form of harassment or bigotry based on a symbol of religion is never okay," she said.